PanARMENIAN.Net - The country formerly known as the Republic of Macedonia officially changed its name to the Republic of North Macedonia on Tuesday, on paper ending a decades-long dispute that should pave the way for NATO membership, . The country can be called "North Macedonia" for short and the national language should continue to be referred to as "Macedonian," state spokesman Mile Boshnjakovski told CNN. He added that its citizens should continue to be called "Macedonians," not "North Macedonians." After declaring independence from Yugoslavia in 1991, the country chose the name Macedonia. But that title severely strained relations with neighbor Greece, which also has a region called Macedonia. 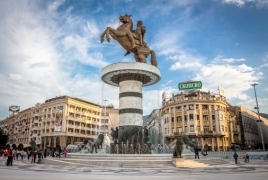 The Greek region of Macedonia lies in the northern, mountainous part of the country and includes its second-largest city, Thessaloniki, as well as the UNESCO World Heritage Site of Philippi. Greece, a member of both NATO and the European Union, had been blocking North Macedonia's membership to the military alliance and the beginning of accession talks with the EU until the name dispute was resolved. But under a name deal reached between Athens and Skopje last month, Greece will lift its objections, paving the way for its neighbor's integration.